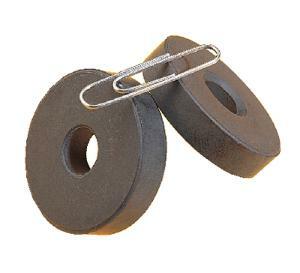 Ceramic Ring Magnets have a high resistance to demagnetization and don't need a keeper. They're made of a mixture of barium and iron oxides and are magnetized along their length. The central hole allows them to be threaded onto a pencil or glass rod to demonstrate repulsion. They may be stacked four-to-five high this way. Each magnet is 6 mm thick and is available in two sizes.